Firi found it quite amusing to watch her friend manically searching the surrounding area. His long Draik tail twitching as he swam from place to place, and his big Draik ears reacting to every sound he heard. It was not the first time Sei had lost his trident (and probably not the last), but he always panicked and was always going on about the dangers of a lost trident. Firi wondered why King Kelpbeard even trusted the guards with these obviously dangerous items in the first place. This season sure does draw attention! With these articles I want to put my thoughts and opinions on the items I think are the best among the over two thousand you can find all over Neopia. With these guides I hope I can motivate and inspire you to create wonderful and outstanding customizations for your pets! - Sit back, grab something to drink and enjoy the falling autumn leaves while reading this great article. As Techo day approaches, the minds of Neopians everywhere turn to famous Techos across the globe, such as the Techo Master, Dr. Death, and that crazy Techo Fanatic who pierces everyone's poor eardrums at the Altador Cup. However, one Techo often overlooked is the Tropical Foods shopkeeper on Mystery Island. He takes immense pride in creating the most dazzling tropical dishes, sure to delight anyone's taste buds. OPEN: KSSMO history files OPEN: file no. 23-543-12, file name: mission records OPEN: subfile no. 12, subfile name: closed missions OPEN: file no. 355222, mission name: KatFL, mission status: FAILED VIEW: read-only, mission no. 355222 VIEW: read-only, mission no. 355222, subfile C: description of the failed mission KatFL, taken via dictation, ver batim, from those involved BEGIN TRANSMISSION: Wally Katt (Director, KatFL Mission. Species: Wocky. Colour: Blue. Gender: Male. ): I still don’t exactly know why everyone elected me as director. I ran as a joke. They said I was “qualified” because I’d led a similar mission via simulation run in some stupid spacecraft outside of Kreludor that only three people knew about, and that was supposed to require some level of Brain Tree-esque genius to complete – and my team survived. Which is just dumb. Being an almighty overlord all the time understandably gets tiring. Don't get me wrong, I wouldn't throw away my boundless power for anything, but even creatures of my high stature need time off. Today was just such a day. I found myself craving some quality Sloth time, outside of the confines of the Virtupets station. Even in my leisure time, there's always work to be done. Today's list entails picking up my dry cleaning, going grocery shopping, and picking up some pet supplies for Roger, my precious, obedient little ultra Pinceron. Quite the labor intensive day this is looking to be, but what kind of ruler would I be could I not best these simple tasks? 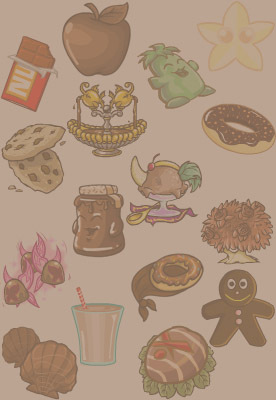 The Chocolate Ball has a unique background featuring different kinds of chocolate items. If you've ever wondered what these items are, their names and what they're made of, this list will give you all the answers. There are eighteen different items, so let's dive in and check out these tasty treats! 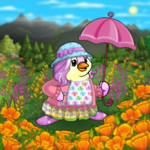 Can I have a petpet? 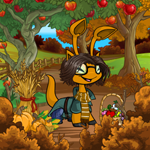 Sometimes finding the perfect petpet can be tricky. “At last, I’ve finally finished! !” Sparkles shrieked, waving five sheets of paper above her head triumphantly. The pink Bruce dashed out of her bedroom, clambered down the stairs and stormed into the living room with her finished piece of work gripped firmly in her hands. “Oh Scary, you won’t believe what just happened!” she exclaimed, her voice squeaking excitedly. This is why you only get to press it once a day. Welcome to the fourth instalment in my series on travelling around Neopia without spending a fortune. The last article finished as we were leaving Moltara and heading towards Shenkuu. If the weather is amenable you have a good chance of reaching Shenkuu in time for the New Year Festival.